The future is NOW, and we want it to be as bright as can be. But when it comes to game reveals, this new year will have to work hard to even come close to 2013. Those 365 days saw the unveiling of the PS4 and Xbox One, along with Titanfall, Destiny, Smash Bros. Wii U/3DS, and dozens more massively hyped games. 2014 will need some big titles to match that, and we know just the games that could get our hearts racing. Why we need it in 2014: Because we deserve an honest-to-goodness reboot of the space fighting fox and friends. Not Star Fox Becomes King of the Dinosaurs. Not Starfox On Foot With A Bazooka. Not Star Fox 64 with Different Voice Actors in 3D. We need Fox, Peppy, Falco, and yes, even Slippy back in our lives, better than we remember them. Star Fox Command kinda had that, but it was burdened with gimmicky touch controls. This is the year to get it right. Who should make it: Nintendo, clearly. Despite our gripes with previous games, theyve yet to truly messed up Star Fox--its just that Nintendo added things that werent the best fit for the series. Strip away all the new and strange mechanics, put the little critters back in their jets, give us Bill and Kat back, and you have yourself a new blockbuster. Of course, wed also be fine with Nintendo handing this big boy over to Platinum Games. Fans have been rumbling about this potential mash-up for a while, and with the developers track record, it might just be the refreshing pair of eyes that this old franchise needs. Why we need it in 2014: Because we know its coming. Well, maybe know is too strong a word, but hints have most definitely been dropped. For instance, this is an image of a brief moment in Sonys PS4 launch trailer. Notice Crashs outline in the background. Notice how its vaguely implying Hey, hes up ahead. We know what youre doing Sony--just spill the beans already. Who should make it: This is a bit tricky. 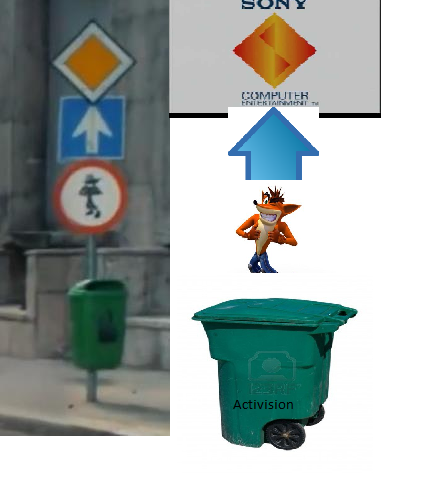 Thereve been a ton of developers and producers rifling through whats left of poor Crash since he stopped being a Sony exclusive. So who deserves to reboot the marsupial? Naughty Dog created him, but theyre kind of onto other things now. Sony just came out with the nostalgic Knack, which was packed with old-school gameplay, but kind of fell apart. Insomniac just came out with the newest Ratchet and Clank, so maybe they should keep their retro gears spinning. Or maybe a smaller, newer dev should take a chance with Crash. Theres definitely no shortage of developers to choose from should Activision and/or Sony choose to bring him back. Why we need it in 2014: Star Wars games saw a death and rebirth last year. It began with the unfortunate (but anticipated) closure of LucasArts--then EA signed a deal to develop new Star Wars games, beginning with a new Star Wars Battlefront. Youd think thatd cover the need for combat in a galaxy far, far away, but we doubt itll provide the kind of gorgeous, fun space battles that GameCubes Rogue Leader offered back in 2001. Yes, the 'Cube saw a Rogue Squadron III, but what we want is a direct sequel with at least one next-gen trench run through the Death Star. Who should make it: EA has the current Star Wars rights, so it would seem that legally, the developer should be one of its internal studios. DICE is busy with Battlefront and Visceral has some other game on its plate, so lets go with the Burnout/Need for Speed guys at Criterion. That team has been slowly shrinking over the last year, so crafting X-Wings and TIE Fighters could get its motor running once more. Though as a gesture to fans, perhaps EA could hire one (or more) of the creative leads from the original Rogue Squadron games. Why we need it in 2014: Because its games have only become exponentially more incredible as theyve been released. Flow? Cool. Flower? Oh, this is nice. Journey? Dear god. Whats next?! And thatgamecompany, while being coy about its next project, is definitely working on something. There's a slot for its unannounced game on its website, and the developer is hiring a bunch of new engineers. With the power of the next gen at its fingertips, its only a matter of time before thatgamecompany wows us again. Who should make it: BioWare. No, thats obviously a joke--thatgamecompany has a flavor all of its own that no one else can touch. However, that flavor may have diminished as some heavy hitters left TGC after Journey was completed: among them being the producer of Journey, one of the lead designers, and the companys then-president. Well just have to wait and see how these absences will affect the next project, and we want to find out before December 31, 2014. Why we need it in 2014: Doom just had its 20th anniversary, which got many older gamers nostalgic for a time when shooting demons with a BFG was all a game needed to be great. But even as the FPS genre thrives, id Software and owner Bethesda have done very little to keep the Doom franchise current. 2014 needs to be the year that the world finally gets to see the never-truly-announced Doom 4 in all its id Tech 5 glory. Who should make it: But how do you do it without John Carmack? ids tech-wizard boss left the company in 2013 after teasing Doom 4 for years. That leaves the ball in Bethesdas court, and while it could keep the development internal, we think it should look outside to the guys behind Bulletstorm. A joint development between People Can Fly and id could give Doom 4 the creative violence it needs, while keeping the same level of technical savvy. Youd just have to convince the Epic-owned dev to work in ids game engine instead of Unreal 4. Why we need it in 2014: For the last three years, its felt like Nintendo forgot all about the Metroid franchise--and we wouldnt blame them after the lackluster Other M. That game should've been the triumphant return to Samus Aran's 2D glory, but what the cybernetic bounty hunter needs now is an actual return to form to reestablish her place as gaming royalty. Sure, Nintendo could make another Prime game, but wed rather see the first truly HD Metroid as a spiritual sequel to the SNES classic. Who should make it: After the poor results from sharing the series with an outside developer, Nintendo should hand back Metroid to its internal studio, Retro. That team made the incredible Prime trilogy, but are now focused on recreating the Donkey Kong Country franchise. That experience with platforming gameplay is great practice for making a new 2.5D game in the style of Super Metroid, but only under the direction of Yoshio Sakamoto, the longtime creative lead of the series. Cmon Nintendo, this is long overdue. Why we need it in 2014: Look, we all know this one is happening, and its long overdue. Fallout 3 and New Vegas were massive hits, and Bethesda now owns all the rights to the franchise, making Fallout 4 all but inevitable. Rumors have been swirling for some time, with some convincing casting documents popping up recently, and were so in need for a return to the wasteland that we really want them to be true. Honestly, Skyrim was two years ago. Who should make it: No offense to Obsidian, but when Fallout comes to next-gen, we want it made by Bethesdas Elder Scrolls team. Those guys found a way to modernize the series while staying true to its past, and they need to be the ones that lead us through post-Apocalypse Boston or whatever. Were not sure why they havent announced the game already (open world games arent easy), and were only hoping that the extended delay will mean that Fallout 4 wont be riddled with the countless bugs that Bethesda is infamous for. Whew, it feels good to get those New Years wishes out in the open. Do you have any games you hope get announced in 2014? Feel free to share in the comments, but, seriously, nobody say Half-Life 3. Its never going to happen. And if you're looking for more to celebrate, check out 2013's game of the year and our pick for what game you're looking forward to most in 2014.